The Israel Cancer Association called the legislation an advanced law but imperfect one that will help curb the aggressive and worrisome marketing of addictive and often addictive products among young people and youth, thereby contributing decisively to reducing the number-one cause of death in the world that can be prevented. The Israel Cancer Association (ICA) announced that Monday, November 5 would be the Day of Awareness to Promote the Fight Against Lung Cancer. As October is Breast Cancer Awareness Month, the non-profit Israel Cancer Association (ICA, www.cancer.org.il) recently held a press conference to mark the event. September 15 is designated as International Prostate Cancer Awareness Day and is marked each year in Israel on the initiative of the Israel Cancer Association (ICA) by disseminating updated facts and statistics on prostate cancer and calling attention to the importance of early detection of the disease. Many non-smokers fearful or shy about objecting to illegal smoking, published in The Jerusalem post on May 31, 2016. Melanoma deaths down, says cancer group, published in The Jerusalem Post on May 18, 2016. Cancer on the Global Stage: Incidence and Cancer-Related Mortality in Israel, published in The ASCO Post on April, 10, 2016. Colorectal cancer killed 1,366 Israelis last year, published in The Jerusalem Post on March 3, 2016. Cancer diagnoses on the rise globally, but so are successful recoveries, published in The Jerusalem Post on February 4, 2016. Security situation hampers Cancer Association Knock-on-Door campaign, published in The Jerusalem Post on October 23, 2015. Supreme Court allows class-action suits against public exposure to smoking, published in The Jerusalem Post on May 12, 2015. "Don't expose yourself to the dark side of the sun" Israel Cancer Association to hold Skin Cancer Awareness Week, published in The Jerusalem Post on May 7, 2015. 2015 AACR Award to Mrs. Miri Ziv for Distinguished Public Service and Global Impact in Cancer Advocacy, published in April 2015. The American Association for Cancer Research has named Miri Ziv as the recipient of its Public Service Award for 2015, published in The Jerusalem Post on April 24, 2015. Nobel winner Ciechanover makes breakthrough in cancer research, published in Haaretz on April 13, 2015. Technion team find proteins that could hold key to cancer growth, published in The Jerusalem Post on April 13, 2015. Israel's War Against Smoking, written by Dr. Robert Rochaway and published by the Joseph and Alma Gildenhorn Institute for Israel Studies, University of Maryland, Research Paper 9. Israel: World's highest rate of non-Hodgkin's lymphoma, published in The Jerusalem Post on February 5, 2015. Wading through widowhood, published in The Jerusalem Post on January 30, 2015. Tel Aviv University cancels campus recruiting event by tobacco company, published in The Jerusalem Post on January 5, 2015. ICA joins global effort to promote universal healthcare, published in The Jerusalem Post on December 12, 2014. Staying Afloat, published in The Jerusalem Post on December 12, 2014. Prevalent in Pink - Pink Products, published in The Jerusalem Post on October 31, 2014. Prevalent in Pink, published in The Jerusalem Post on October 31, 2014. Israel's cancer survival rate 6th highest among 85 countries, published in The Jerusalem Post on October 21, 2014. Lung cancer rate for Haifa women 26% higher than national average, published in Haaretz on October 21, 2014. Decline in breast cancer for Jewish and Arab women, published in The Jerusalem Post on October 2, 2014. Grapevine, published in The Jerusalem Post on October 1, 2014. 2400 men diagnosed with prostate cancer annually, but survival rates are rising, published in The Jerusalem Post on September 16, 2014. Study: Screen all Ashkenazi women for BRCA mutations rather than wait for family history, published in The Jerusalem Post on September 7, 2014. Towards a better life: Tennis and gene testing, published in Esra on September 7, 2014. Dictionary of Cancer Terminology, published in The Jerusalem Post on July 13, 2014. Aufklärung statt Angst, published in Jüdische Allgemeine on June 15, 2014. Cancer association director-general: Stricly enforce no-smoking laws, published in the The Jerusalem Post on May 29, 2014. Cancer Association: Melanoma deaths down for both men, women in Israel, published in the The Jerusalem Post on May 26, 2014. 'Health Ministry is failing to prevent skin cancer', published in The Jerusalem Post on May 15, 2014. Cancer causes one in four Israeli deaths, published in Haaretz on February 6, 2014. More Israelis survive cancer, but it's still the No. 1 killer, published in The Jerusalem Post on February 5, 2014. From our Archives, published in The Jerusalem Post on November 4, 2013. Carmel Gov't Hospital holds informative seminar for lymphoma patients, published in The Jerusalem Post on October 25, 2013. Israel sees sharp drop in breast cancer deaths in past decade, published in Haaretz on October 8, 2013. 'Knock on Door' campaign spreads cancer awareness, published in The Jerusalem Post on October 8, 2013. Pink Revolution, published in The Jerusalem Post on October 1, 2013. Inspectors told to look out for public smoking on No Tobacco Day this weekend, published in The Jerusalem Post on May 30, 2013. Sheba scientists discover cause of chemotherapy-induced infertility, test experimental drug, published in The Jerusalem Post on May 16, 2013. Aggressive skin cancer on rise in Israel, says report, published in Haaretz on May 13, 2013. Israel Cancer Association urges citizens to be free from meat on Independance Day, published in The Jerusalem Post on April 15, 2013. HU biochemistry professor to receive major award from American Association for Cancer Research, published in The Jerusalem Post on April 8, 2013. Screening and early diagnosis reduce colorectal cancer prevalence, mortality rates, published in The Jerusalem Post on March 5, 2013. Cancer rates down, youth awareness of risks up, published in The Jerusalem Post on January 30, 2013. In High Court petition, no-smoking advocates protest alleged 'hidden cigarette advertising' on 'Big Brother', published in The Jerusalem Post on January 16, 2013. Seeing the light, written by Tal Laor and published by Maariv Magazine on December 19, 2012. The Israel Cancer Association's role as a volunteer organization in forecasting, establishing, implementing and upgrading palliative care services in Israel, published in Palliative and Supportive Care, Cambridge University Press, 2012. ICA's Knock-on-the-Door campaign to raise funds for fighting cancer, published in The Jerusalem Post on October 22, 2012. Haifa and Bat Yam skies lit up pink for breast cancer, published in The Jerusalem Post on October 17, 2012. Israel Cancer Association launches annual fund-raising awareness campaign, published in The Jerusalem Post on October 15, 2012. Report: Risk of breast cancer is rising for Israeli Jewish women, published in The Jerusalem Post on October 15, 2012. Taxes raised on cigars, cigarettes and beer, published in The Jerusalem Post on July 26, 2012. Yearning to breathe free, published in The Jerusalem Post on June, 24, 2012. ICA: Melanoma rates down in women, steady in men, published in The Jerusalem Post on June 13, 2012. Privatizing enforcement of smoking laws rejected, published in The Jerusalem Post on May 31, 2012. C'tee bans smoking in some outdoor areas, published in The Jerusalem Post on May 2, 2012. Majority supports expansion of anti-smoking law, published in The Jerusalem Post on May 1, 2012. Colorectal cancer being diagnosed earlier, published in The Jerusalem Post on February 29, 2012. Israeli researchers say more doctors should recommend marijuana to cancer patients, published in Haaretz on January 30, 2012. 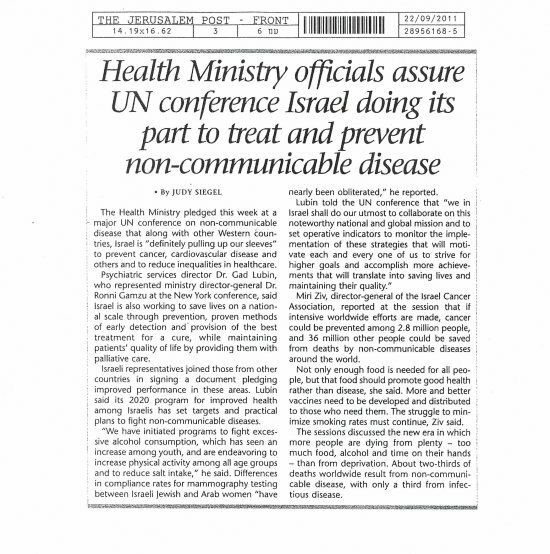 "Health Ministry officials assure UN conference Israel doing its part to treat and prevent non-communicable disease, published in The Jerusalem Post on September 22, 2011. ICA "Brainpower, innovation... We love Israel", published in ISRAEL21C on August 3, 2011. ICA related "Israeli researchers identify protein that may slow down pancreatic cancer", published in Haaretz on July 13, 2011. Mrs. Miri Ziv "Israeli to be Global Ambassador in ongoing fight against cancer", published in The Jerusalem Post on June 20, 2011. Manchester Christie Cancer Hospital's praising of Israel and ICA's efforts for cancer research, published in The Jewish Chronicle on March 6, 2011. ICA and the Colon Cancer Awareness Month "More Screening and early detection needed to overcome colon cancer", published in The Jerusalem Post on March 2, 2011. ICA and World Cancer Day "Take care of your body and cut cancer rate in half", published in The Jerusalem Post on February 2, 2011.